I saw an ARC of this book in Florida around three months ago and have been awaiting it’s release with baited breath since I read the blurb on the back. Anyone who knows my reading habits knows I pick up a book with the words WWII in the description like it is my job to read the subject all the better is it is a spy story. I was completely underwhelmed by the finished product though. This book had the potential to be so many things yet fell short before choosing any of them. 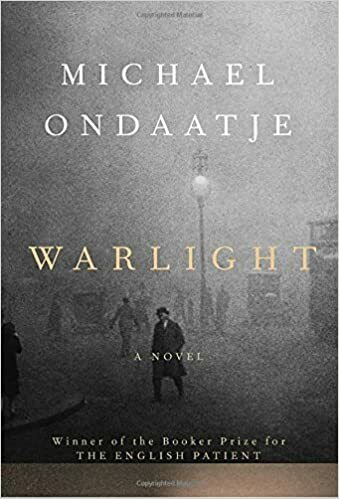 Warlight may have been the story of two siblings left in London with a mysterious figure known to them as The Moth, but it hardly focused on that fact at all. It could have been a story about the figures that stumble through Nathaniel and Rachel’s home while their parents are away but only really focuses on two or three of them, and not well. This could have been a novel about Nathaniel’s sexual maturity but we only brushed against the subject before he was whisked away. I began to think it would be a novel about greyhound racing which was not mentioned in the least but then suddenly everything flipped on its head and it wasn’t that either. Eureka, I thought at that point, obviously this is a novel about what Nathaniel’s parents were doing when they left home and what they did during the war. Except besides lots of research and some minor clues we never get the whole story there either. I give up I will never understand what this story is about. The writing style was fabulous, and to me the only redeeming factor of the book. I thoroughly enjoyed the almost magical characterizations of people and places. I read none of the reviews about this book before starting in and I am disappointed in the time I spent struggling to finish this book. I kept hoping that something would be resolved but no conclusions were contrived. Nathaniel was the POV throughout the story and he just seemed to read his life along the lines of a medical journal. Not enough emotion in relation to some of the events. Have you read other Ondaatje? I agree with you about the style, and I thought this one started slowly. I think he’d reject the need to finish the “This story is about. ..” sentence as much as he’d reject the need to tell a story in a linear fashion. Try THE ENGLISH PATIENT. I actually have not read any of his other works. I have seen a lot of positive reviews for The English Patient since I read Warlight, part of me is terrified that I might be stepping back into that undefined world. I have purchased it and will try to get it into my TBR rotation sometime in the next month or two after I forget this.